Making compromises is usually a good thing, but not when it comes to food. And your hectic nursing lifestyle—12-hour shifts, double shifts and those night shifts that are particularly notorious for wreaking havoc with your eating habits—may lead you to make too many compromises about eating. You might skip a meal and then overindulge at your next one. Perhaps you skimp on breakfast if you’re planning on going out for lunch, and then find yourself wolfing down not-so-healthy snacks so you can make it to lunchtime. When you have eating habits like these, you lose track of what you’re eating and how much. That’s a recipe for weight and health issues. The bottom line is that you should eat three meals a day—meals made up of reasonable portions of healthy foods—and you can allow yourself reasonable portions of healthy snacks in between those meals. Here are some simple ways you can take control of your food portions and therefore eat healthier. 1. 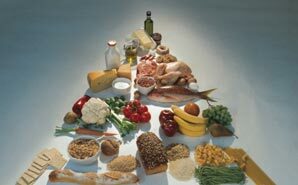 Know how many servings of food from each food group you should have each day. Keep in mind that these are just guidelines. Your age, gender, exercise routine and current weight (and whether you’re losing or gaining weight) will help you determine if your serving numbers should be at the lower or higher ends of each range.